Every PT practice owner will tell you that their team means everything to them. They are the heartbeat of the practice and keep the blood pumping. From managing daily operations to treating patients, the practice team needs to be top-notch to get results. Similarly, you need to be a top-notch recruiter to attract valuable talent. What does this mean? 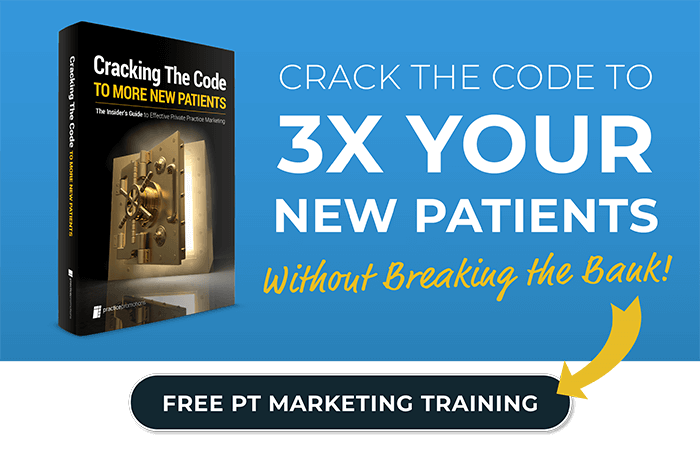 Just like when you market your services to patients—you need to market your practice to PTs and staff. Let’s see what other practices have done to successfully hire rockstar employees. Do a “dry run” through your current hiring process. This will help you experience what people go through to apply. First, use Google to search for “physical therapy jobs in [your town]”. Is your practice’s career page at the top of the search results? Are you listed on any job posting sites like Indeed or LinkedIn? People need to be able to find the job opportunities you have available to even consider applying. Tip #1: Have a dedicated careers page on your website with standard roles available (even if you are not actively hiring). Why is this important? Because you don’t know if your lead PT will come in tomorrow and give notice. That day has happened to the best of us. And, it causes a scramble to cover appointments and fill the gaps. Usually, owners wind up treating patients to help out. Thus, they have even less time to create job postings and get them online. Having a few standard postings for PTs, PTAs, front desk, admin etc. on your website keep you at the ready. If you are actively hiring, you want to be posting on more than just your own website. Most new hires find their roles through job search listings. Think LinkedIn, Indeed.com and Monster for starters. You can also post specific roles through PT recruiting sites. Be sure to manage your company’s profile on these job sites. Yes—your company will already have an online reputation on these sites. It’s important it be accurate and positive if you want to get great candidates. If you’re lacking in reviews, ask your most recent hires if they will provide feedback on these sites. They will most likely be positive (since they got hired) and build good reviews. We’re going to use a self-example here. Your careers page is just as much a part of your practice’s brand as the homepage or the logo on your building. Plus, it has the potential to relieve hiring headaches. Tip #2: Keep your application short and simple. Top talent is often looking for new opportunities when they are still actively employed. They are looking for something better and more potential, which is exactly what you want on your team. Thus, you want to make it simple and quick to apply. What do you really need to know when starting the physical therapy hiring process? Realistically, it’s the applicant’s name, contact information (phone and email) and their resume. That’s it – you don’t need their blood type and SSN for an interview. Too many practices bog applicants down with a process that feels like a request for top-secret data. Likewise, you can easily weed out poorer quality applicants just by looking at their resume. Once you have their personal info and resume, you should be able to say “yay” or “nay” for an interview. Tip #3: Have a phone screening interview. You can gauge an applicant by their communication in scheduling and completing a simple phone interview. Do they respond promptly? Are they communicative and professional? Once the interview is scheduled, do they follow directions and call in on time? It should be a clear “yes” to all the above for any desirable applicant. This ensures they can complete basic admin functions and keep a schedule. During the phone interview, let the candidate do most of the talking. You want to learn about them and listen actively to how they convey their experiences and career goals. Key things to consider: focus, passion, and ambition. First, can they carry a narrative about what they have done professionally and its value? Second, do they seem to really enjoy PT and working with patients to help them feel better? Third, what is their end goal? They should be able to articulate a 3-5 year plan or what their next career move should be. As a practice owner, you want PTs and staff that are motivated to do more and bring their experience and skills wholeheartedly. People who are intelligent, competent and team players will convey this attributes through their dialogue and attitude. Bonus pro tip: have a silent staff member be a listener on the call to catch things that you might miss when talking to the applicant. Tip #4: Be transparent throughout the process. No one likes waiting around for the next steps in a job application. If the phone screen goes well, let them know that you will contact them within 48 hours with next steps. That sets a time and expectations for any news. We recommend delivering good news (ie. Moving ahead to an interview) over the phone as that gives you a sense of their enthusiasm. Hopefully, the applicant is still excited to move forward and be part of your team. But, they might not be the right fit and you can read this base on their reaction. However, avoid delivering bad news in person. You can save a lot of awkward and stressful communication by sending a simple email thanking them for their time. But, let them know that you will not be moving forward with them in the process. Tip #5: Remember, they are also “interviewing” you. The best PTs and staff know what a good practice feels like—its energetic, professional and pleasant. You want to convey these qualities throughout your application process from job posting to final interview. Your website is often the first interaction a candidate has with your practice. Is it professional, high-quality and functioning? Does it feel like something relevant in 2018? It is important that your digital presence reflects your in-clinic experience. You also want to create a positive, lasting impression when the candidate interviews either over the phone or in person. Be sure to be upbeat and personable when communicating. For phone interviews, avoid areas with a lot of background noise and try to limit interruptions during the call. For in-person interviews, you want to set the scene. Start with a brief tour of the facility and use this time to explain key things about your practice’s values and mission. Then, conduct the interview and include any relevant PTs or staff members as needed. Sometimes, it is easier to engage in a dialogue with more than one interviewer especially if that other individual will be interacting with the candidate on a daily basis. Lastly, be conscious of the time as the candidate will most likely be interviewing in the midst of their daily schedule. Limit time blocks to no more than 2-3 hours and be a good host, offering water/coffee and restroom breaks as needed. Physical therapy hiring is ultimately about finding the best fit for the role and for your practice. You want to attract top talent, through a professional website and efficient application experience. And, those candidates need to want to accept an offer of employment and be excited about joining your team. Recruiting should be an ongoing process and something you feel passionate about doing. For more tips on physical therapy hiring and recruiting best practices, subscribe to the PT Marketing Blog or follow us on LinkedIn. And, if you need a website that attracts both patients AND employees… Start here!